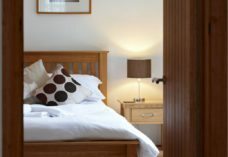 4 star bed and breakfast with beautiful countryside views, central location to all beaches and footpaths. Spacious double with king size bed and en-suite shower with TV, Wi-Fi, tea/coffee tray, off-road parking, no pets or smoking. Guest dining room with extensive views, serving a CONTINENTAL breakfast and a warm welcome. Cooked breakfast available for £5 extra pp. Carreg Adventure, a refurbished mansion house set in its own grounds located about 600 yards away on the A4118. Fairyhill, a Georgian country mansion set in 24 acres is approx. 2.7 miles away and will cater in 2018 for 150 day guests in its new orangery. The king Arthur nestled at the bottom of Cefn Bryn, Reynoldston which is 1 ¼ miles is also a popular restaurant and pub. The Oxwich Bay with views overlooking the bay with restaurant and walled gardens is just 3.8 miles away. Oldwalls in Llanrhidian, a 5 star award winning wedding venue set in its own grounds is 4.2 miles away. We come to Gower often and wouldn’t stay anywhere else. Comfy, spacious, lovely views and great breakfast. Just like home with someone else getting the breakfast. Thanks very much for the warm welcome, cosy stay and delicious breakfast. Quiet, comfortable stay and great location for our walks. Lovely place, fantastic value, see you soon. Have special requirements? Call Christine Griffiths on 01792 390922.